Us,I GREEN LED is founded in 2008 and HK sales office established in 2013,IGLED as product brand. Our factory located in the Shenzhen Longgang BaoLong Industry Park,that is obvious geographical advantage.We are a professional manufacturer of LED lighting,which specialized in R&D,manufacturing and exporting LED lights and LED appliance.We through strict implementation of ISO9001 quality management system, promoted I GREEN LED products to meet DLC、UL、TUV、VDE、SAA、ETL、CE、RoHS certification and qualified as a superior supplier in shape led industry. ▼ Repay the society with social responsibility. 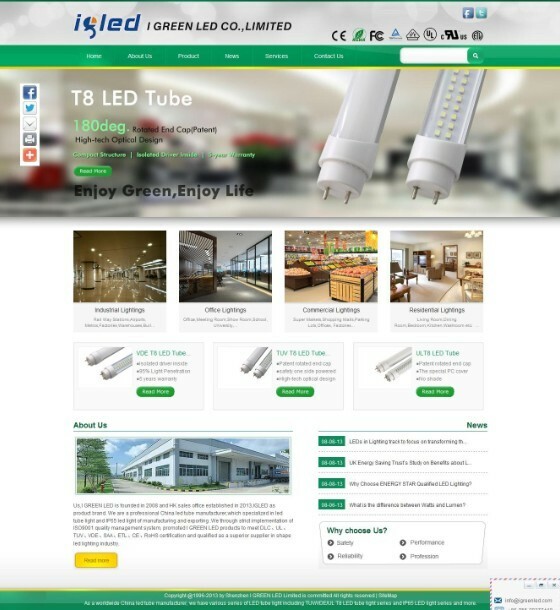 I GREEN LED owns comleted production lines,including SMD Package,SMT,Power Supply,Plastic Molding,PCB Cutting Automatic,Aluminum House Cutting,PCB Soldering,etc.Except typical LED Tubes,we also provided LED Panel Light,IP65 Tri-proof LED Light,LED Highbay LED Light and more.95% of our products are exporting to Europe and U.S.A.
Our goal is to make all people's life brighter with less energy consumption and less electricity bill number.Choose I GREEN LED, choose clean earth, healthy life and bright future!